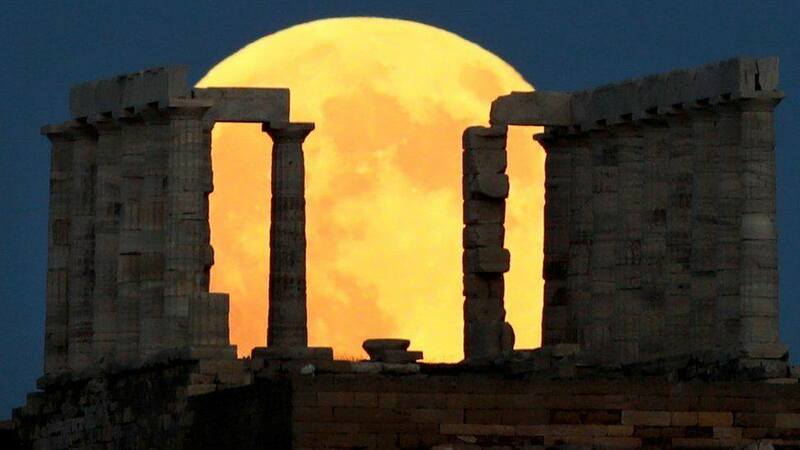 The moon is the same size in Athens as in London. To take a photo like that you go a long way from the Greek temple, so the temple appears to be smaller than your little-fingernail with your arm stretched out. You then get a powerful telephoto lens to zoom in and wait for the moon to rise. If you have done your calculations correctly you have positioned yourself so that the moon appears right behind the temple. If you were standing there, the moon and the temple would both be small and the temple would be in the distance. You can get similar photos in London. You just need a viewpoint from which you can see the buildings of the city and is in the right position (direction and distance) for the moon to rise (or set) in just the right place. Michael Tomas captured such a picture. Why does the Moon sometimes look Yellow? Why does the face of the moon 'sync' with the earth? What were the challenges for the ancients to observe the orbit of the Moon (instead of Mars)?